Low ad rates for this site! We get more than 20,000 visits a week, a nice advertisement audience. Check out our advertising rates. Advertising. When prices were more appealing. WATKINS GLEN, May 12 -- The Watkins Glen Public Library last year received boxes of clippings, photographs and memorabilia from the estate of Bill Kelly, a man well known in the community for his interest in history. Some of the photos -- in negative form -- have been provided to The Odessa File to process into positive images and to publish here. Thus we offer this sixth batch of photos. All of these were in negative form, in many cases without explanation of specific locale or time frame -- but nonetheless fascinating glimpses into this area's past. If anyone has information on any of the photos, please don't hesitate to e-mail us what you know, so we can further enhance the viewing experience. To e-mail us, just click here. Photo in text: In front of a Shepard Niles building, later the Montour House. 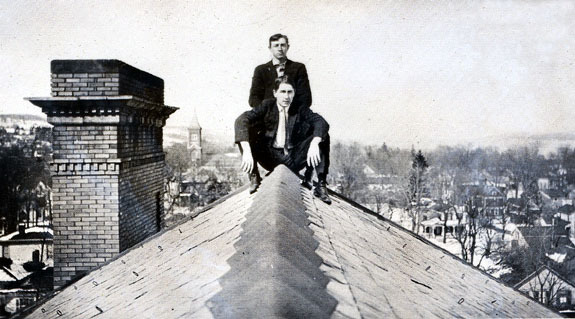 1920s students at Watkins High School. St. Mary's basketball team from the early '50s. One reader says that pictured in the front row, kneeling, are Joe Fazzary, Fran Chiacchierini, Pat Pangallo, Bob Marciniak, Rocco Marcellino, Tom Minichiello, and Jack Pastore. In the back row, standing, she says, are Frank Chiacchierini, John Lurcock, Nick LaPre, Jim Powers, and Richard Salvatore, along with a priest identified by another reader as Father Brady. Near the turn of the last century. Undated, with only some first names visible as identification. 1928 Senior Trip to Mount Vernon. Bowling trophy time. One reader says they are Bub Smyder, Frank Conte, Cal Drake, Stew Gifford, Hank Edsall and Bob Pike. On the sidewalk in Montour Falls. One reader, Bob Scott, wrote that "the gentleman on the left is my father, Wendell Scott, who owned and operated Vedder & Scott Furniture Store" and that the photo was snapped in the mid-1960s. The occasion might have been a sidewalk sale, an annual promotion by the Chamber of Commerce back then. Undated photo of football team in front of the old Watkins High School. Presumably a crew involved in the schools' transportation system. In front of the Jefferson Hotel. WATKINS GLEN, March 22 -- Some photos from the collection of the late Bill Kelly of Watkins Glen are on display in the showcases at the Watkins Glen Village Hall. They come from the collection of clippings, photos and memorabilia recently received by the Watkins Glen Public Library from the estate of Kelly, a man well known in the community for his interest in history. We've been scanning some Kelly Collection photos from negative form and presenting them on this website (see below). Those on display at Village Hall are mostly 8-by-10 black-and-white prints secured and posted by Mayor Judy Phillips. The three here were snapped by the editor at Village Hall for reproduction here. We'll photograph a few more of them in the coming weeks. Photo in text: Stately Magee Manor, now lost to history. Then-Governor Nelson Rockefeller and his wife Happy at an overlook near Watkins Glen. Fourth Street in Watkins. Specific date unknown, although the car gives a hint. WATKINS GLEN, Feb. 27 -- The Watkins Glen Public Library recently received boxes of clippings, photographs and memorabilia from the estate of Bill Kelly, a man well known in the community for his interest in history. Some of the photos -- in negative form -- have been provided to The Odessa File to process into positive images for publication here. Thus we offer this fifth batch of photos. All of these were in negative form, many without explanation of specific locale or time frame -- but nonetheless fascinating glimpses into this area's past. If anyone has information on any of the photos, please don't hesitate to e-mail us what you know, so we can further enhance the viewing experience. To e-mail us, just click here. Trolley on what appears to be Genesee Street in Montour Falls. A horse-drawn water wagon travels a dirt street. It looks like Montour Falls. 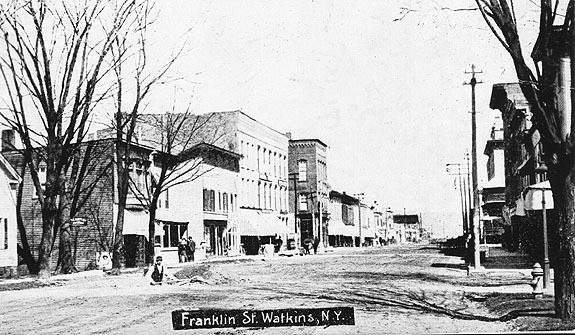 One reader identified this as Franklin Street, Watkins Glen in 1880. "The house with the pillars," she wrote, "is the Kingsbury House, which is now the site of the Ford garage." Two readers responded with identification of this group of men. It's the Watkins Glen Village Board in 1961. From left were: seated, Bruce Beardsley, trustee; Gilbert (Chic) Lodge, mayor; and George Scaptura, clerk; and standing, trustees Fred Gillette, Albert Haughey and John Norman. A posed shot with three dozen people, mostly female. Any idea what this was from? This scan of a thick negative gives the appearance of fading, but close examination of the negative with a magnifying glass brings out some extra features. The sign on the right says "Chicken/Trout Dinner and Blue Plate Lunch 50 Cents." Above it is a small sign that says "Breakfasts 30-35-40-50." Signs in the distance, along the sidewalk, read "The Thompson Cottage. Glen Entrance" and "Rooms 75 Cents Per Person." On the left, across the street, are a couple of signs. One on a building says "Ice Cream Sodas" and one in front of it says "Gifts." There is no date on the photo and no specific locale mentioned, but the cars in the street look to be circa 1920s. This was presumably snapped out on Seneca Lake, date unknown. WATKINS GLEN, Jan. 24 -- The Watkins Glen Public Library recently received boxes of clippings, photographs and memorabilia from the estate of Bill Kelly, a man well known in the community for his interest in history. Thus we offer this fourth batch of photos. Most have no explanation of specific locale or time frame on them, but nonetheless offer fascinating glimpses into this area's past. If anyone has information on any of the photos, please don't hesitate to e-mail us what you know, so we can further enhance the viewing experience. To e-mail us, just click here. A shot of downtown Watkins Glen not too many decades ago, judging by the cars. This was among a number of photos showing some flood damage in the 1930s. Downtown Watkins Glen, back in trolley days. Another shot from a small collection depicting 1930s flood damage. Anyone have any information on this one? This is presumably a small part of the crowd at Summer Jam, 1973. This was a photo on a very small negative apparently clipped from a larger one. Downtown Montour Falls, in the horse and buggy days. WATKINS GLEN, Dec. 25 -- The Watkins Glen Public Library recently received boxes of clippings, photographs and memorabilia from the estate of Bill Kelly, a man well known in the community for his interest in history. Some of the photos -- in negative form -- have been provided to The Odessa File to process into positive images for eventual printing, and for publication in certain instances here. Thus we offer this third batch of photos. Most have no explanation of specific locale or time frame on them, but nonetheless offer fascinating glimpses into this area's past. If anyone has information on any of the photos, please don't hesitate to e-mail us what you know, so we can further enhance the viewing experience. To e-mail us, just click here. Photos at right: These two shots were on the same negative strip -- showing a chilly day in downtown Watkins Glen in an unspecified year. Some of the faces in this photo are sharp, and some are blurred -- likely because their owners moved while this old-timey shot was snapped. 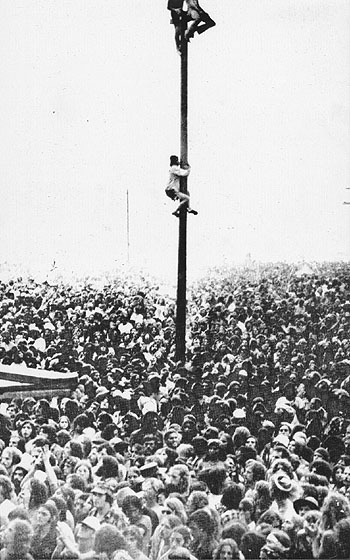 A competitor pole vaults over a makeshift bar in an era before softer landings were devised. A placid day in downtown Watkins after automobiles had made inroads. Note the brick surface. This photo's negative has the words "The Sag" written below the image. East Fourth Street in Watkins Glen. Presumably on the northern edge of Watkins Glen. The negative of this photo has "The Mile" written in the border below the image. A wet day in a visually welcoming Watkins Glen. Anyone know how long that sign was up? Workers install the railroad bridge in the gorge. 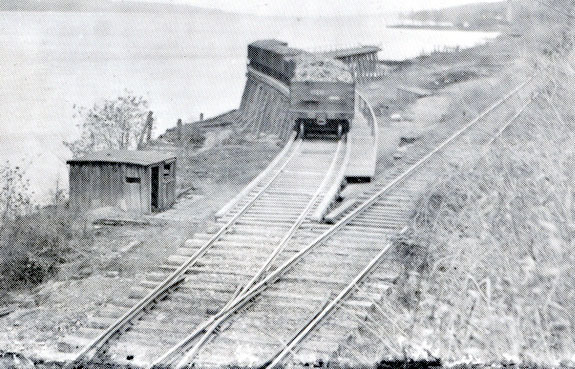 Rail cars rest on a siding alongside Seneca Lake. Date of this photo is unknown. WATKINS GLEN, Dec. 17 -- The Watkins Glen Public Library recently received boxes of clippings, photographs and memorabilia from the estate of Bill Kelly, a man well known in the community for his interest in history. Thus we offer this second batch of photos. Most have no explanation of specific locale or time frame on them, but nonetheless offer fascinating glimpses into this area's past. If anyone has information on any of the photos, please don't hesitate to e-mail us what you know, so we can further enhance the viewing experience. To e-mail us, just click here. At right: There is no information accompanying this photo, but the assumption is it was from Summer Jam in 1973. An early Watkins Glen race along the old Grand Prix circuit -- here as it enters the village on Steuben Street. Captain Palmer's boat, date unknown, backs up on its way, presumably, to a tour of Seneca. 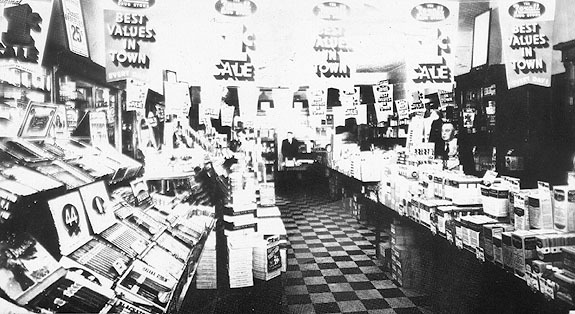 Interior of Cole's Rexall drug store, with a wide selection of cigars on the left. The Schuyler County Legislature is shown in this partially washed-out photo. The spindle-legged desks are still used by today's legislators. An interesting archway on the northern end of Franklin Street, near Seneca Harbor Station. The only marking on the negative of this photo was "220-yard dash." As the lettering says: Franklin Street, with some work in progress on the left. 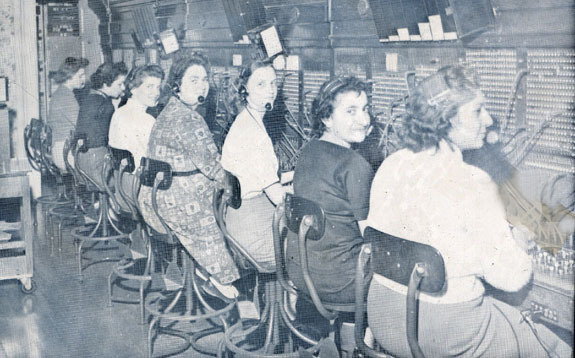 A team of operators, presumably at the local telephone exchange. These vehicles were public transportation between Watkins Glen and Geneva. WATKINS GLEN, Nov. 22 -- The Watkins Glen Public Library recently received boxes of clippings, photographs and memorabilia from the estate of Bill Kelly, a man well known in the community for his interest in history. Thus we offer this first batch of photos. Most have no explanation of specific locale or time frame on them, but nonetheless offer fascinating glimpses into this area's past. If anyone has information on any of the photos, please don't hesitate to e-mail us what you know, so we can further enhance the viewing experience. To e-mail us, just click here. Photo to the right of the text: The Watkins Glen State Park gorge on an unspecified date. Notice that there is somebody on the upper walkway. Was this on Franklin Street? Possibly a forerunner of Clifford Motors? Beardsley & Forbes: Does anyone know where this was located? A local diver says she may have seen this vessel on the bottom of Seneca this past summer. Does anybody know in what years this trolley ran? Notice the trolley tracks in the foreground. One observer says this was on Decatur Street. Signage partially visible on the front of this trolley indicates it ran between Watkins Glen and Montour Falls. The bend in the road at the north end of Watkins Glen. The Jefferson Hotel in Watkins Glen, date unknown. Up Padua way: This establishment -- a mineral springs health resort and hotel -- was very popular and sometimes served the famous. The Watkins Coal and Ice Company.